Further details of the escape of Mexico’s most infamous drug lord, Joaquin “El Chapo” Guzman, aka Shorty, have been shown in a new video broadcast by Mexican TV station Televisa. The leaked footage shows that 26 minutes passed between El Chapo Guzman’s escape from his cell through a tunnel in the shower and guards noticing he was gone. The hapless guard first on the scene reports a “big” hole – but does not clarify that the prisoner is missing. 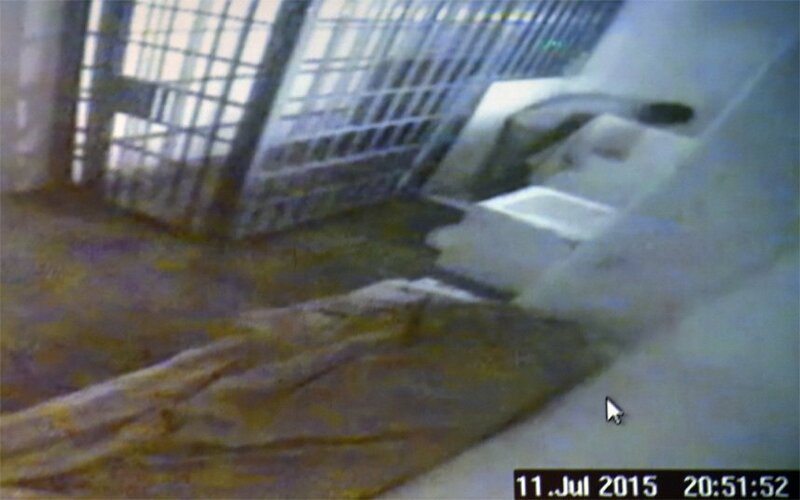 El Chapo Guzman has been on the run since his jailbreak on July 11. The CCTV footage is a longer version of that shown by the government shortly after El Chapo Guzman’s escape and has audio – which the one shown by government officials did not. It reveals the reaction of the guards as they reach the cell and find no sign of the inmate – and a large hole in the floor of the shower area. The guard, who is standing just outside the cell, repeatedly calls “Guzman? Guzman?” and receives no answer. He then alerts his commander, telling him that there is “a hole in the shower drain”. “No, boss, he’s not,” the guard replies. Televisa showed side-by-side shots of the CCTV footage from Shorty Guzman’s cell and from the control centre where guards monitored the prisoners. Prior to his escape, the sound of loud hammering can be heard and El Chapo Guzman is seen turning up the volume of his TV. Despite the sound of drilling that could be heard underneath the noise from El Chapo Guzman’s TV, the guards monitoring the screens seem unmoved. However, it is not clear what the guards could see on their individual monitors. The staff in the monitoring centre also apparently fail to notice the moment Shorty Guzman disappeared behind a small wall dividing the shower from the rest of his cell. He had previously apparently used the toilet, inspected the shower area, then put his shoes on. El Chapo Guzman’s escape from the maximum-security Altiplano jail was a huge embarrassment to the government of President Enrique Pena Nieto. Not only was it the second time that El Chapo Guzman had broken out of a top security jail, it came just months after the then-attorney general said Guzman did not pose a flight risk. Dozens of people have been arrested in connection with the escape, including many guards and the prison’s director. On October 14, the governor of north-western Sinaloa state said extra soldiers had been deployed to the border region with Durango state to search for the fugitive drug lord. Joaquin Guzman was born in Sinaloa and is the leader of the powerful cartel of the same name which has smuggled huge amounts of drugs from South and Central America to the US. The international crime gang is also engaged in myriad other criminal activities such as money laundering and extortion, and has been blamed for countless murders.